If you are a fan of goat's milk cheese, you know how unique the flavor is. It is often something of a tangy, tartiness, and you usually seek it out, intentionally. You know what you are going to get and you do this mental comparison to a sharp cheddar or buttery manchego. Goat's milk cheese can usually provide that extra something. While it is tart, and maybe even bitter (thanks to the capric and caproic acids), it is absolutely refreshing. Traditonally, goat’s milk cheese in made by hand; production has been mainly in areas where goats have been domesticated and in regions with farms or homesteads. In these places, agriculture is inveterate to the land, rather than new or transported in. Goat's milk cheese is made throughout the world, but predominantly in Europe, and includes subtlties from countries, including Greece, France, and England. Some of the most famous and sought-after artisanal goat's milk cheeses (chevres) are from the French countryside, along the banks of the Loire River. The Loire begins in the Cevanne highlands, a mountainous region in south-central France, and it runs northwest for over a 1000 miles, cutting a path through central and western France. It ends at the Atlantic Ocean harbor town of Saint-Nazaire, but not before creating a vast system for irrigation and lush, fertile valleys. 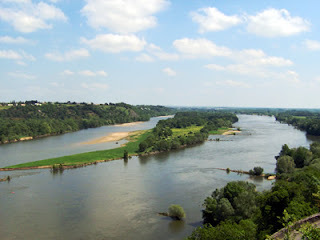 The climate in the Loire valleys is very moderate, which has made farming and wine-production home to the area since, likely, the 1st Century (C.E.). Within these valleys, in the central part of France, is a region called "Berry", which makes up most of the political departments of Indre and Cher (The Cheese Primer, p. 88). And it is Berry, where cheese and food products are described as Berrichon, that is famous for its production of goat's milk cheeses. In the region, there are still numerous small herds of goats, at most of 40 animals per farm, who feed on the available, lush flora. It is thought that the cheese made here is especially rich because of this environment, containing "subtle nuances of clover, herbs, pine, and pepper." (The Cheese Primer, p. 89). So, do you want to try some traditional, french, berrichon chevre? It may be difficult to find it in most U.S. stores. Steven Jenkins' writes that, "..The classical, French goat cheese is so special because the human touch involved in the process encourages the real, natural flavor to emerge. If the cheese is too encased in fancy, modern packaging and has a gaudy, costly label, it is nearly always the product of a commercial plant and should be passed up...". He continues that mottled, blud mold on the rind is okay, and is an indication of the natural process and even desirable. In addition, to maintain its flavor and robustness, cheesemongers argue that these chevres should be eaten within the first 2-3 weeks of production; exporting and selling on a large-scale is difficult in that time frame. However, if you can find the Selles-sur-Cher (A.O.C.) 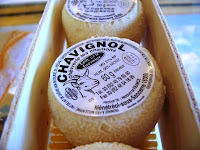 chevre or the (unpasteurized!) Crottin de Chavignol or Pouligny-Saitn-Pierre (both A.O.C. ), and they are within 3-8 weeks old, then you are golden and you are getting the 'real deal'. Bonne chance. 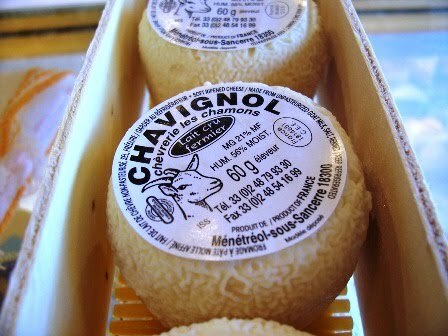 Just bought Clos Chevrel, a Selles-sur-Cher cheese. It has a dark rind and it tastes very good. Initially, and naively, I was taking the rind out. What a mistake. The rind brings a very special flavor.